Home > Lymphopenia predicts response to stereotactic radiosurgery in lung cancer patients with brain metastases. > Anti- > Lung cancer tissue array (2 of 5), including TNM and pathology grade, 208 cases 208 cores details. Notes: Unless specified, all TMA slides are not coated with extra layer of paraffin (tissue cores can be easily seen on the glass), so there is no need to bake, can be directly put into xylene for de-paraffin procedure. 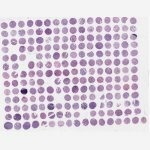 Unstained: unstained paraffin tissue microarray slide.